The Macro Economy Today is noted for three great strengths: readability, policy orientation, and pedagogy. The accessible writing style engages students and brings some of the excitement of domestic and global economic news into the classroom. Schiller emphasizes how policymakers must choose between government intervention and market reliance to resolve the core issues of what, how, and for whom to produce. This strategic choice is highlighted throughout the full range of micro, macro, and international issues, and every chapter ends with a policy issue that emphasizes the markets vs. government dilemma. The authors teach economics in a relevant context, filling chapters with the real facts and applications of economic life. 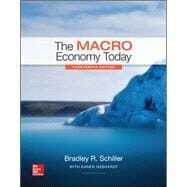 Schiller is also the only principles text that presents all macro theory in the single consistent context of the AS/AD framework. The Macro Economy Today, fourteenth edition, is thoroughly integrated with the adaptive digital tools available in McGraw-Hill’s LearnSmart Advantage Suite, proven to increase student engagement and success in the course.